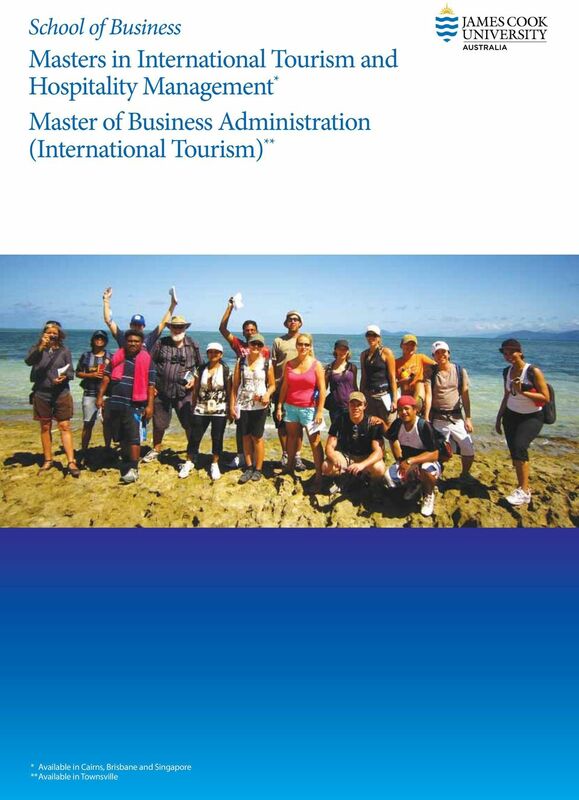 Download "Masters in International Tourism and Hospitality Management * Master of Business Administration (International Tourism) **"
3 Why study Tourism at JCU World Class research (National and International rankings) The Excellence in Research Australia (ERA) ranked JCU as a level 4 (superior and above) international standard. McKercher, B. (2008) Jogaratnam, G., et al (2005) and Zhao, W., & Ritchie, J. R.B. 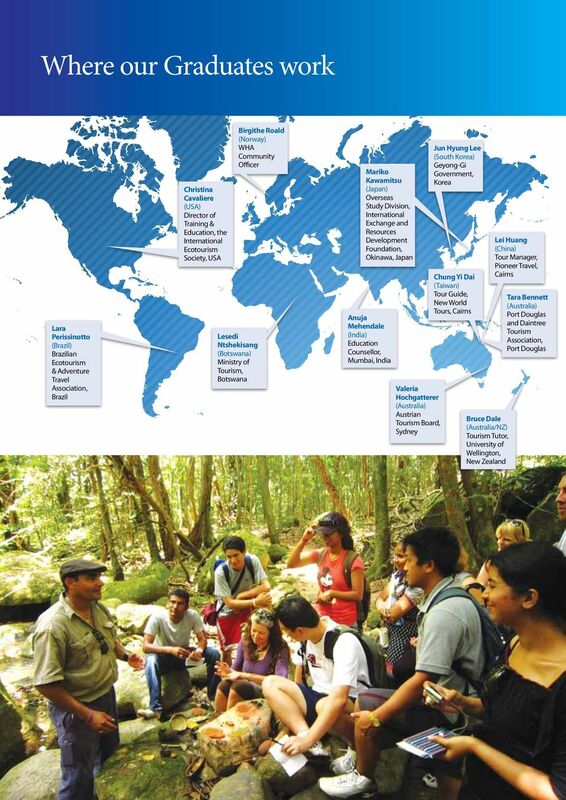 (2007) Tourism Management ranked JCU and its scholars in the top 5 institutions in the world. Awards to staff for teaching excellence National Australia Learning & Teaching Council awards to three JCU staff who teach in the Masters degree Recognised by UNWTO since 1993 JCU acknowledged for its first Professor in Tourism in Australia and for contributing to tourism education globally including courses in Asia and Europe Perfect tropical locations Our setting provides studies of coral reef tourism, rainforest, outback tourism and events with both a local and international perspective These locations help international students understand and identify tourism issues in their own settings as well as in Australia Emphasis on sustainable tourism development All of our subjects emphasise the broad requirements of sustainability for the future of tourism Over 700 graduates working globally Employment success of our past graduates from JCU in the tourism area has been high with careers being developed across countries and continents A community which enjoys international students Both Cairns and Townsville are moderate sized communities, opening and welcoming to international students and aware of food, accommodation and personal requirements Pathway to other degrees Both the MITHM and the International Tourism Major can be a pathway to a PhD by research The vast array of course elements of MITHM instilled a foundational understanding of the international tourism and hospitality management industry. I have acquired the skills to critically think with a global mindset. As part of my degree I enrolled in an internship at a Destination Management Organization (DMO). 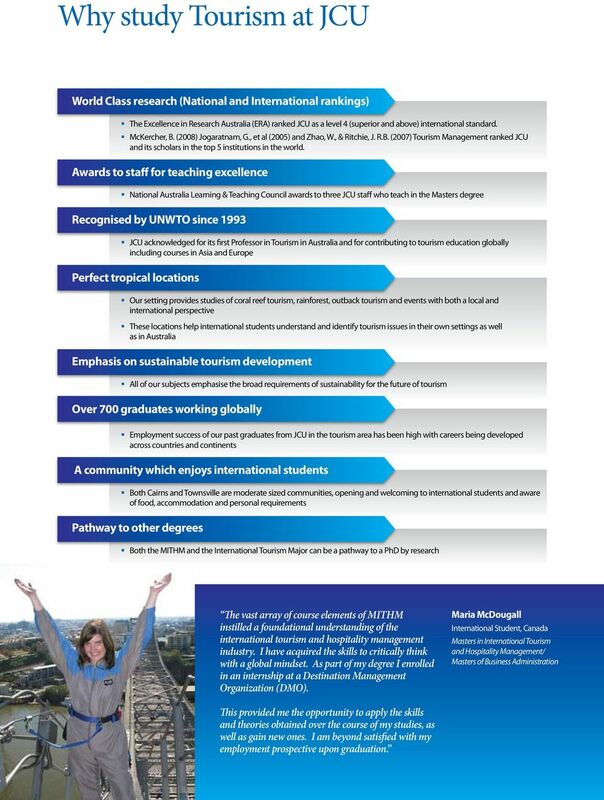 Maria McDougall International Student, Canada Masters in International Tourism and Hospitality Management/ Masters of Business Administration This provided me the opportunity to apply the skills and theories obtained over the course of my studies, as well as gain new ones. I am beyond satisfied with my employment prospective upon graduation. Hospitality and Tourism 2016 PROGRAMMES Taste life. Right here Passion, service and flavour. These are some of the key ingredients we bring together in our School of Hospitality. Cookery. Patisserie. ESH Paris Hotelschool International Hospitality and Tourism Management Programs in London ESH Paris is the only hotelschool to offer a UK Master degree in Paris, the first tourists destination in the world. Esplanade. Shenton Way. 5.8km 8.6km. Orchard Road. 7.2km. 23.2km. 27.3km. Zoological Gardens. JCU Singapore. 15.9km. Jurong Bird Park. Bachelor of Tourism Management Whether they come to bungy jump, take in New Zealand s natural wonders or sip wine in the Wairarapa, international tourists recognise New Zealand as an exciting travel destination. Falco-Mammone, Fay (2005) Beach images: meaning, measurement and management. PhD thesis, James Cook University. 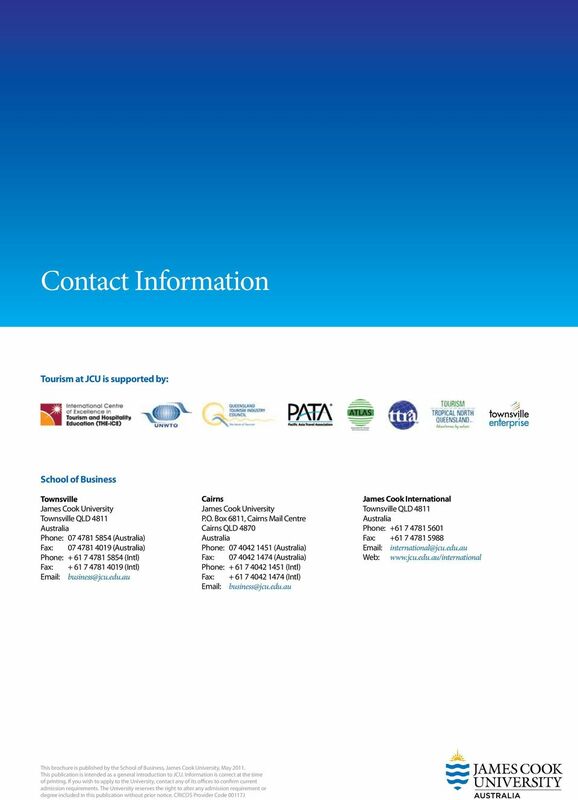 Bachelor of Business Studies Upgrade your diploma or advanced diploma to a Bachelor of Business Studies from Charles Sturt University Diploma to Degree in two years. Advanced Diploma to Degree in 18 months. KOREA UNIVERSITY Graduate School of International Studies KOREA UNIVERSITY Korea University, founded in 1905, is widely acknowledged as one of the oldest, largest and top-ranked universities in Korea. Want a career that can take you places? MBA. 1 Year full-time 2016/17. 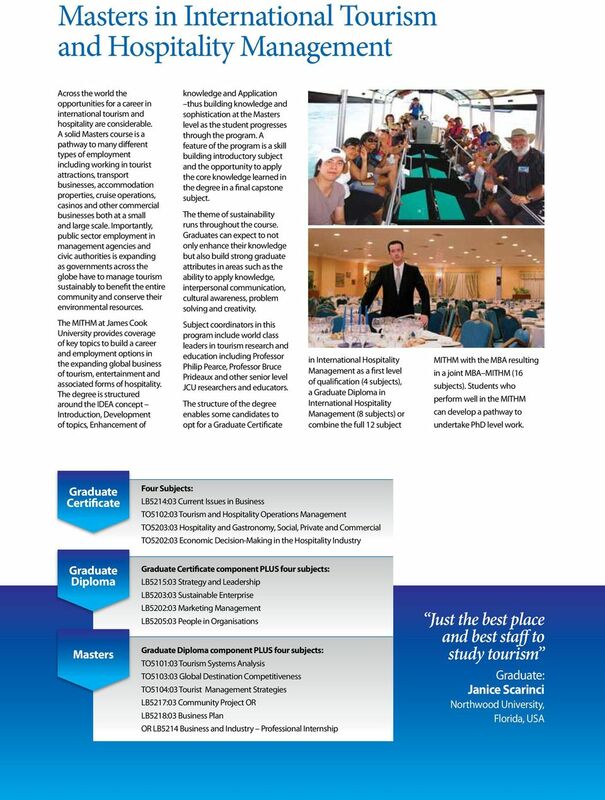 www.smurfitschool.ie. Business. Imagined Better. Together. 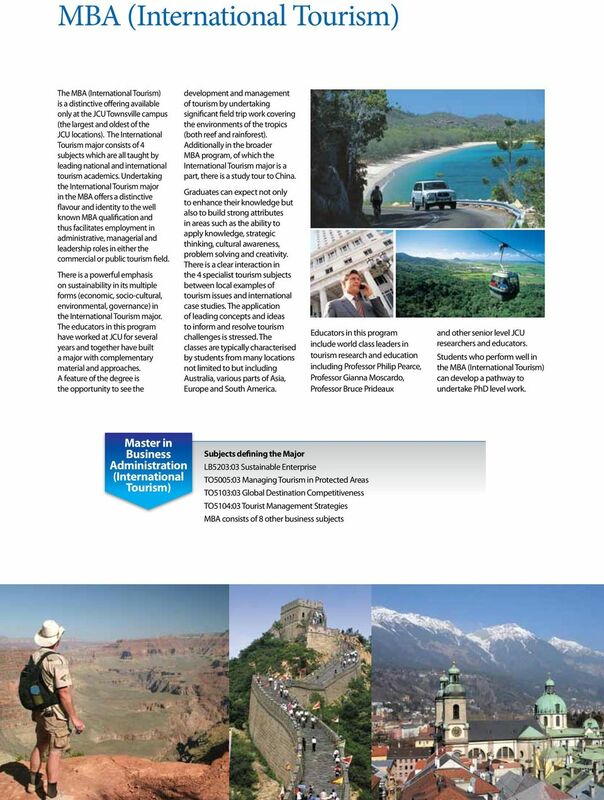 SOUTH AFRICA Company Profile FORGET WHAT DAY OF THE WEEK IT IS Company Profile Flight Centre Travel Group is an Australian based international travel company and the largest retail travel outlet in Australia. Centre and the International Centre for Systemon-Chip and Microwireless Integration.